Using Solar Power at night? All of us would think that this feat is impossible but thanks to a new method in harnessing the power of the sun, this is made possible. This new tech can be found at the middle of the Nevada dessert. It has a central tower that is surrounded of 10,437 glass panels, merely 1 million square meters of glass! This solar oasis can store energy and can supply electricity to 75000 households. It works like a multifaceted glass panels that can track the course of the sun (like sunflowers do). Kevin Smith, one of the founders of the project, said that the field of mirrors concentrates the sun’s energy and reflects it to the top of the central tower. He calls the new tech the molten-salt storage. In the molten-salt storage the central tower secretes a reservoir of potassium and sodium nitrate and will heat it at 288 degrees celcius producing a clear water-like liquid. After doing so, it is circulated in narrow, thin-walled tubes situated at the top of the tower (where the sunlight is reflected to). When the liquid flows down, the liquid is stored in a tank. 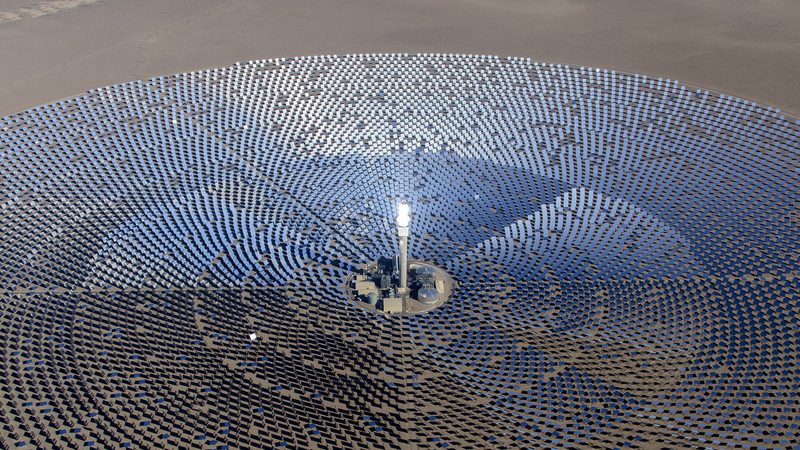 The molten salt can efficiently maintain its heat and can converted to electricity through a steam turbine. Want to know more about this awesome device? Follow this Link!